Don’t let the end of the holidays stop you from creating showstopper meats. Cayt from Caty’s Meats and Meals has curated the perfect recipes for flavorful and tender ham as well as foolproof prime rib. 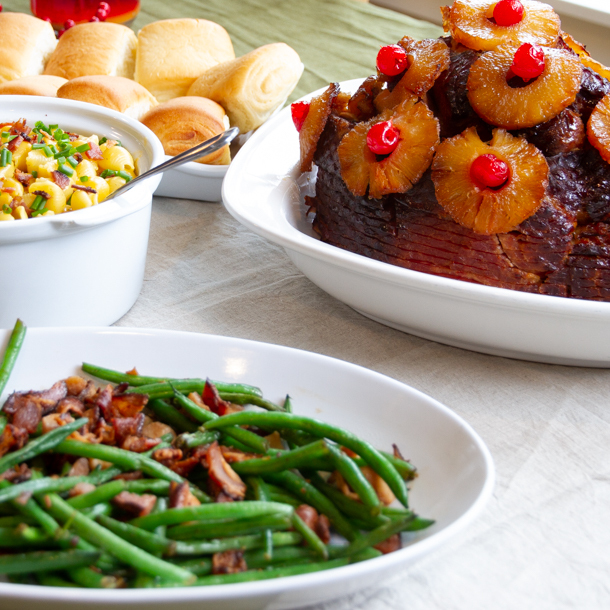 Follow these recipes to keep the holiday spirit and tastes alive through the whole year. No need for a tropical getaway. 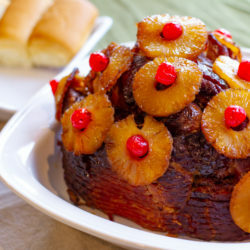 This ham recipe combines the naturally salty ham flavors with a tropical exterior for an exciting twist on a classic ham. Everyone knows the crust of the prime rib is the most important part. 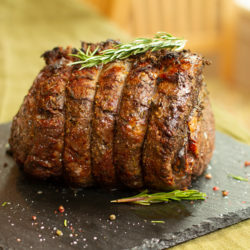 Luckily, Cayt’s recipe will help you achieve the perfect blend of spices and herbs for an extremely flavorful prime rib. Every great game watching party needs delicious and copious amounts of foods. With that in mind, we bring you the most epic way to display your favorite game day snacks, the Snackadium! 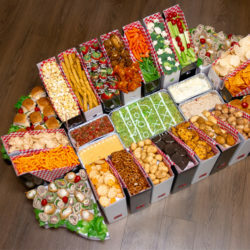 This easy to build Snackadium is sure to impress your guests and feed your entire team of hungry fans. After acquiring all of the necessary components, begin lining your portals and stadium seating with deli liners to welcome your favorite team into their Snackadium. After all portals have been lined, fill each seat with fans and organize by following the Snackadium Blueprint. Once your Snackadium is complete, be sure to invite fellow fans over and snack the game day away to cheer your favorite team on. Grab your crab and start boiling! Learn how to perfect this classic seafood delicacy just in time to wrap up your holiday celebrations. Crabtivating, delicious, fun! First things first, pick up your crab ingredients and start prepping. Fresh crab is clearly ideal, but frozen will do if you can’t get access to fresh seafood. If you can get them fresh, wonderful, but if not, start by thawing your frozen crab legs. The most ideal and best way is overnight in your fridge, but if it’s a last minute store run or too many other items clogging up your shelf space, you can run them under cool water in a strainer to thaw them quickly. Step 2: It’s boiling time! Next, take your pick on how you decide to cook them. You can steam, grill, or even use a microwave. But our recommendation is to boil them. This helps keep the meat moist, and heat quickly. Fill a large pot with cold water, about 2/3 of the way full. Add salt to the water, and bring it to a boil. Add about 4-6oz of crab legs at a time to the boiling water, being sure to emerge them into the water entirely (this may take some bending, tucking, etc). Then, let the water return to a boil. Cook uncovered for about 5 minutes, or until they are heated through. Be sure to flip them once or twice through the process to ensure they are cooked evenly and heated throughout. Once cooked, use large tongs to remove them from the water. You may rinse them if desired, but not necessary. Step 3: The hardest part, getting the meat out. Take your cooled and cooked crab legs, and twist at the joint. If you prefer, you may cut the shell instead. As they can be sharp and/or slippery, using a clean cloth may be of assistance. As you twist, you may be able to pull the meat out directly. If not, using a clean knife or kitchen shears to cut through the shell to access the rest of the meat. Be sure to clean them out entirely, you don’t want to miss any of the good stuff. To harvest additional crab meat for legs that are split, easily pull apart the shell with your fingers. 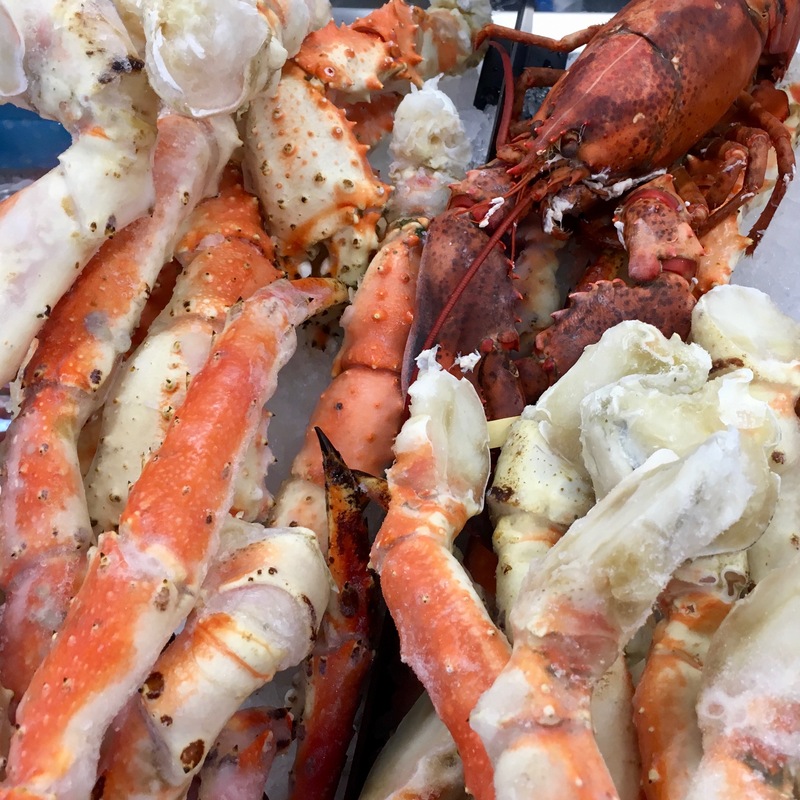 Use a small fork (seafood fork if you have one) and remove the meat from the legs and claws. You’ve made it to the most enjoyable part, it’s crab consumption time! Let your seafood be the star of the meal, and don’t overdo it with complexity. If you chose to forego getting the meat out yourself to leave some entertainment for your table guests, serve up the cooked legs in a bucket or pot and let everyone twist and carve them up themselves! If the crab legs aren’t already split, have your clean shears or knives available at the table. Each person will need a small fork to get the meat out of the shells as we discussed before. Add your sides for flavoring across the table, such as lemon wedges, melted butter, or dill. The more butter the better, so come prepared with separated servings for your guests. To take your butter to the next level by adding fresh herbs before placing it on the table! Dig in, and enjoy your delicious crab feast! 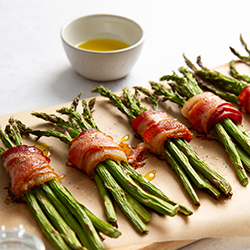 Wrap up your prep and put the final touch on dinner with this bacon wrapped asparagus. It’s delicious simplicity will make you feel like a chef of a five star restaurant with a few easy steps! Pickup a bunch of fresh asparagus and trim off stems before cooking. Prep your oven to 400 degrees. Lay out desired amount of bundles, individual or many, and wrap them in 1-2 pieces of bacon. Place bundles onto baking sheet lined with aluminum foil. Season bundles with salt and pepper, or desired additional seasonings. Drizzle olive oil over bundles, and place in the oven. Bake for 25-30 minutes, or until asparagus starts to wilt, and bacon is fully cooked. Serve as a side for breakfast, lunch, or dinner… a great addition to any meal! New Year’s is upon us which means family and friends, New Year’s resolutions and parties filled with food. That’s where we come in–to help you throw the perfect New Year’s party. From delicious in-store cheese balls to classic sparkling cider to steaks and lobster tails, check out our deals this week to help you save money on party favorites. Want to truly delight your guests? Present them with a delectable charcuterie tray. 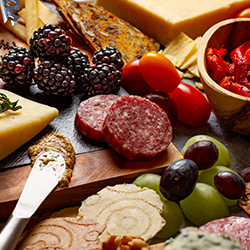 Learn the basics to this crowd pleaser by clicking here for Charcuterie 101. We know you’re busy, so let us share the load by ordering our deli and bakery party trays. Get a classic antipasto tray, the healthy veggie tray, or something more hearty with the sandwich tray. 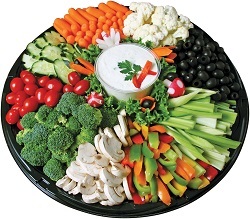 Click here to view our party tray selection.